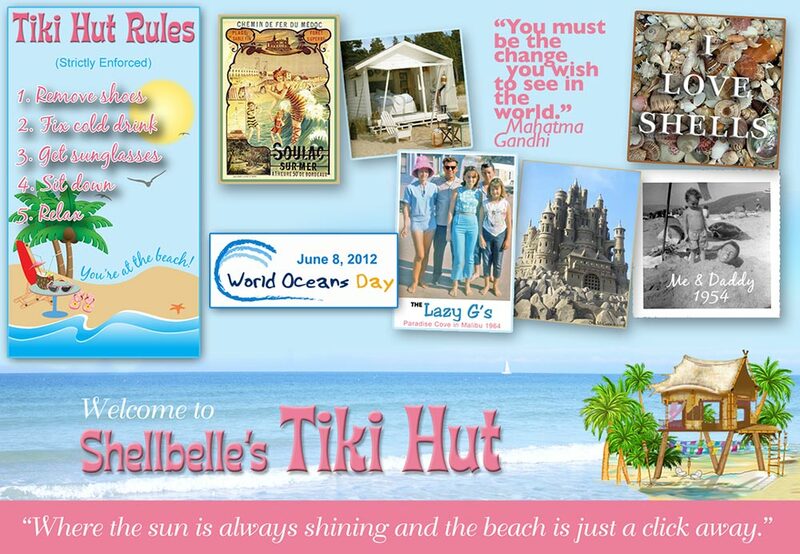 Shellbelle's Tiki Hut: World Ocean's Day Online Beach Party! World Ocean's Day Online Beach Party! 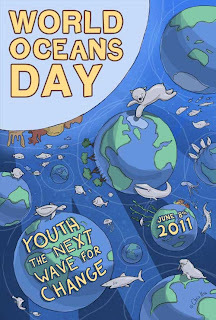 Happy World Oceans Day 2011! Today, people around the globe are gathering together to celebrate World Oceans Day. There will be coastal clean-ups, educational trips to aquariums and zoos, lectures, interactive displays, nature walks, sustainable seafood festivals, and the list goes on. Scientists will be at events worldwide, speaking on the vital role ocean research plays in the lives of each of us. Concerned citizens will be making commitments to lifestyle changes that will have positive effects on our shared ocean. You can join them by taking The Seven Cs Pledge to Protect our Ocean. While there you will learn how you can make a difference in your lifestyle choices. 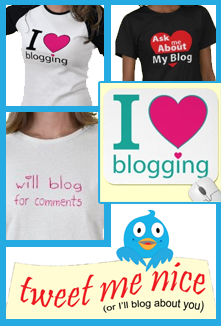 Then there's folks like us, who belong to a HUGE online community through our blogs! 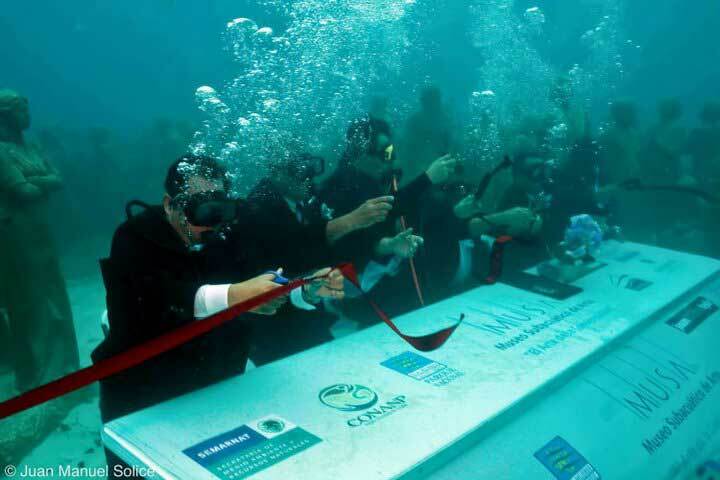 I want to personally thank each and everyone of you for coming by today to celebrate our mutual love of the ocean. Some of you have been waiting for this day and have prepared posts that you can link up at the bottom. I can't wait to see what you've shared with us! I know there will be stories, facts and photos around our community today that will show us your love of the sea and shore. Others have come by to read and learn from us. Together we can make a difference and I am humbled by your commitment to this cause. In January of this year, I wrote three back-to-back posts on a grand piano that a 16-year-old boy dumped onto a sandbar in Biscayne Bay here in Florida, saying that he thought it was, "Cool and artistic." 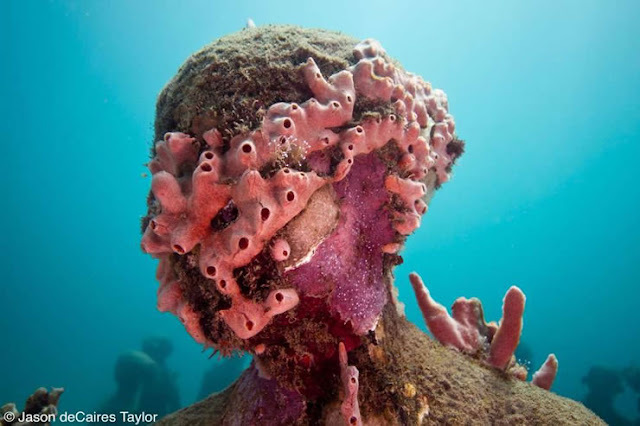 I ranted about how destructive this was to our environment, but it got me to thinking — here was this one story that was making headlines around the world and while it did bring attention to the importance of ocean conservancy, it wasn't showing how art and the environment can come together in perfect harmony. I started researching artists who have made positive, environmental impacts and believe me, there are MANY! Then I came across one artist who brought a whole new meaning to art as an environmental tool and it is his work I want to share with you today. I've been holding onto this research until now, because I believe what he does epitomizes what celebrating World Oceans Day signifies to many of us. The organizers of World Oceans Day say that it is about "making lasting change and it's up to people like us to rise up and be the voice for the ocean all year long." For me there is a voice I've now heard and I am deeply moved by his commitment to protect our ocean. You can click on this image to see amazing detail! 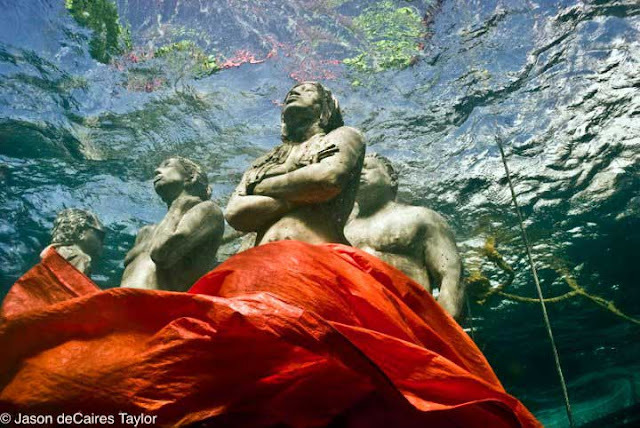 What Taylor created, sea life has continued to build upon. The work evolves and will for generations to come! Underwater Sculpture Art of Jason deCaires Taylor, Vicissitudes, Grenada, West Indies. From Taylor's website I learned that "in 2009 a monumental underwater museum called MUSA (Museo Subacuático de Arte) was formed in the waters surrounding Cancun, Isla Mujeres and Punta Nizuc." 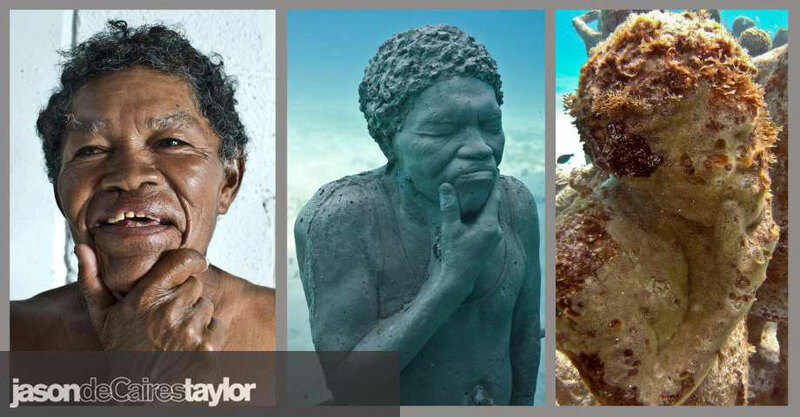 "To date the underwater museum comprises of 4 installations; La Jardinera de la Esperanza, Coleccionista de los Sueños, Hombre en Llamas and The Silent Evolution all created by Jason deCaires Taylor. 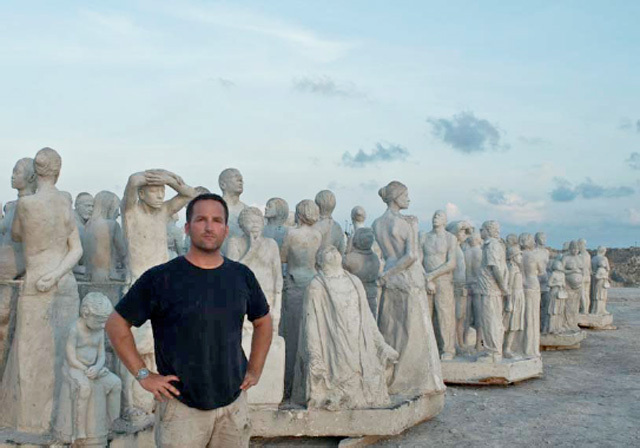 The Silent Evolution, his most ambitious work to date, is a collection of over 400 life-size figurative works, forming a vast gathering of people aiming to define a new era of living in a symbiotic relationship with nature." By now you're probably shaking your head and asking yourself why I would be so excited about someone dumping installing something in our ocean, even it is "artistic and cool." Let me explain, these are not ordinary statues. In the words of the artist, "The sculptures are designed to become artificial reef units. 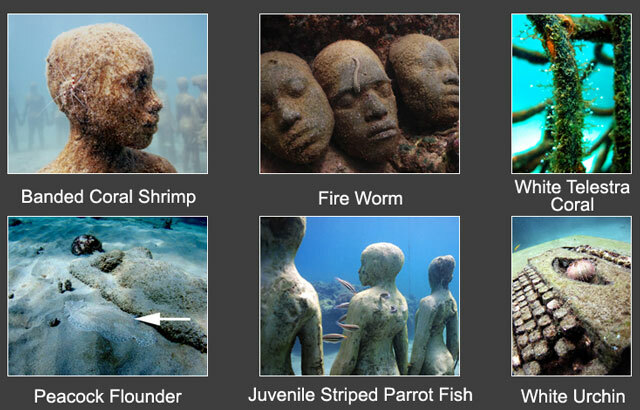 The cement used is a special type of marine-grade cement that's engineered to attract corals; corals adhere to it, they grow, they make different formations, that in turn encourages fish and other marine life." 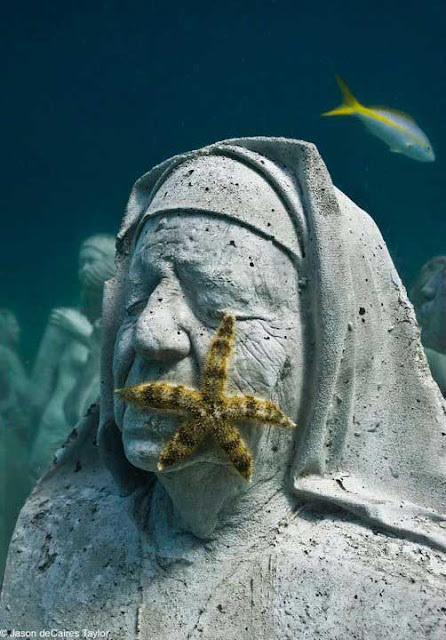 Just a few months after the more than 400 statues were installed, they were already attracting schools of fish, lobsters and algae. "With scientists predicting a permanent demise of 80% of our natural coral reefs by 2050, The Silent Evolution illustrates a potential symbiotic relationship between man and the life-systems of the underwater world; one that is critical if our grandchildren are to have the opportunity to see these beautiful habitats for themselves." 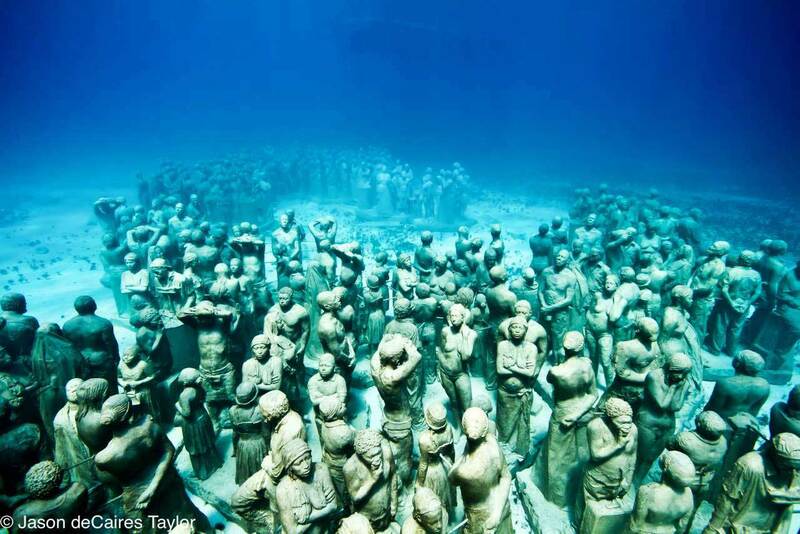 I did tell you that this is an underwater museum, didn't I? 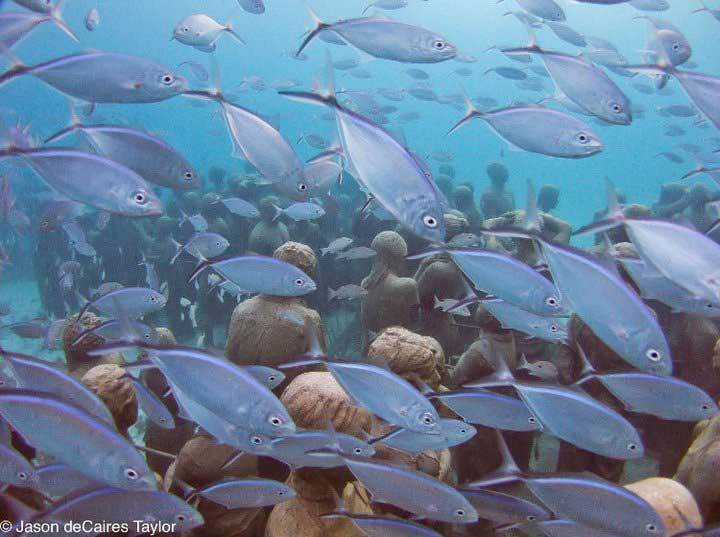 According to the museum, the third stage of the museum commencing in 2011, will involve commissioning local and international artists to contribute further sculptural installations and host special underwater cultural events celebrating the Arts and Science. The installation won't ever really be finished, since the marine life will keep adding touches for centuries to come. MUSA can be viewed either by scuba diving, free diving, snorkeling or from a glass-bottom boat. Taylor is currently founder and Artistic Director of the Museo Subacuático de Arte (MUSA) in Cancun, Mexico. I could go on and on (and on) about Taylor's art, but there's a party going on and I don't want to take up all your time. I will encourage you to visit Jason deCaires Taylor's website at a later date to learn more about his work and see more photos. I suggest you start here and click through all ten pages if you'd like to learn more about the subjects of his work. Trust me you don't want to miss reading about The Archive of Lost Dreams, where a male registrar collects bottles containing messages from all over the world. Oh yeah, he's a statue and the bottles are REAL. A special thanks to Jason deCaires Taylor for not only creating magnificent art, but for using your incredible talent to help protect our oceans. Thank you for bringing people around the world and other artists together and showing the rest of us that man and our environment can live in harmony in a mutually beneficial manner. You are amazing! "Why should I care about coral reefs?" Often, many people only become involved in a cause when they see how it directly impacts their lives. I'm here to tell you that you'd be hard-pressed to find someone whose life is not impacted in some way by coral reefs and the overall health of our ocean. Because of their structure, coral reefs provide shoreline wave protection from tropical storms and hurricanes. Much like wetlands on land, coral reefs act as a nursery for the sea, providing space for fish and other marine life to spawn, hide and feed. Oceans provide us with food, cycle our water, generate most of the oxygen we breathe, balance our climate, supply us with medicines and much more. This pygmy sea horse is no bigger than a little fingernail. Now don't you want to Save Our Seas for this little guy? 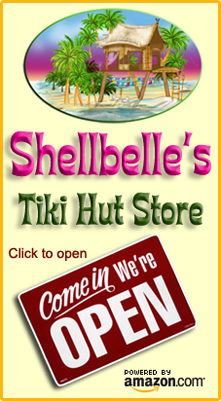 Thank you again for coming to my party and remember, everyone who links up their ocean-related post between now and midnight on Sunday will be entered into a drawing to win a special box of goodies from Shellbelle's Tiki Hut. It's not too late to write a post or even link one that you've posted recently, it just needs to share your love of the ocean with the rest of us. The Linky tool will be open until Midnight Sunday EST. I will be placing a permalink to this post in my sidebar for future reference. I hope you all get a chance to visit everyone who has participated and no, you don't have to do it all today, we'll all be here waiting to show you why we love the ocean so much and why we feel it is so important to protect her. You can also join my friend Cris in Spain for the 3rd Oceanic Blog-A-Thon. This will be the third year Cris and I have blogged together to share our love of the ocean. The first year I wrote about the importance of Mangrove Trees and last year I did the same for Oysters. I LOVE celebrating our world ocean! To add your post, click on the blue Inlinkz button below, add the permalink to your blog post (that's the link that goes directly to your post, not just your blog), and follow the instructions to select a photo. If you have problems adding your post, just email me your permalink or a link to your blog and I'll add it for you. Thanks for posting for the ocean! thanks so much for sharing this amazing art..just incredible! you're doing a great job promoting world oceans day! What a fascinating world. You are a gifted researcher. Thank you for sharing your love of the oceanic world with us. Your passion is contagious! 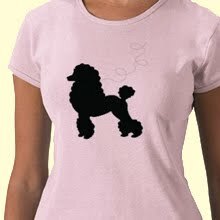 This is so great Rhonda! 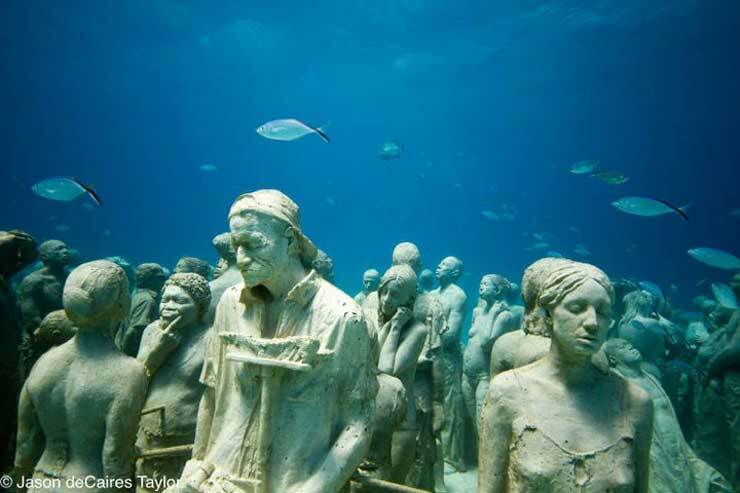 The underwater museum is incredible and so beautiful! I linked up, not sure why my image won't show. Thank you for hosing an Happy World Oceans Day to you! What an incredible way to start a coral reef! I like this much better than sinking old ships. What a talented and thoughtful man! Thanks for sharing this, and Happy World Oceans Day! Amazing post, girlfriend! hi there! i just found out about your party from Michelle (emerald cove) and i linked up to a recent post i did from my beachy break....although my post is mostly photos.....hope that is o.k? well, this artist that you are featuring is amazing....thanks so much for sharing him with us! 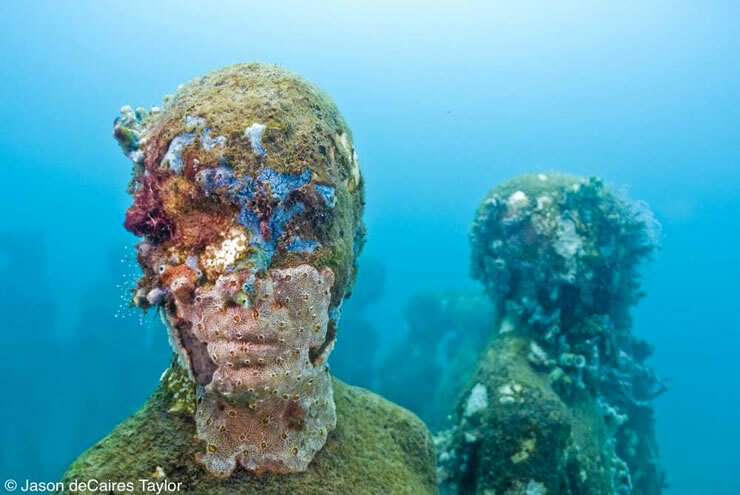 it is kind of bittersweet that his sculptures (although incredibly beautiful and ethereal) are adding another human element to the sea. i am all for helping to create more coral reefs...last time i went snorkeling in mexico, the reefs were not doing well (sad). if we have to (and we DO, have to)get a long with nature i am glad we can do it in an artistic way....and i agree this is better than sinking old ships. This was unbelievable! Wow! Thank you so much for posting about this wonderful world under the sea. You post was really interesting. 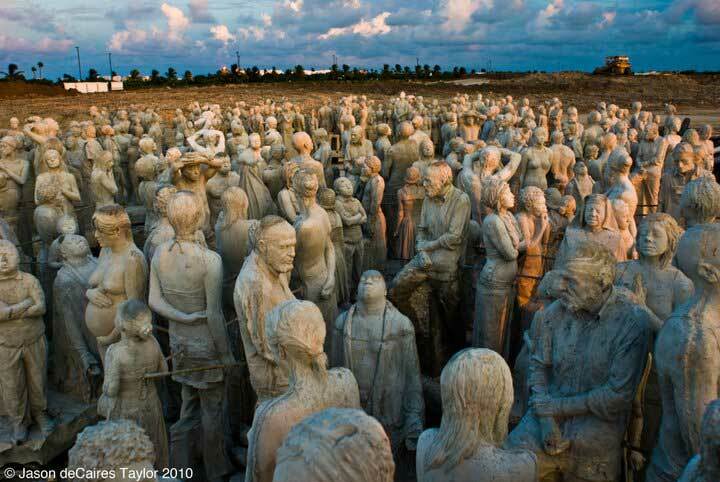 The sculptures are amazing. 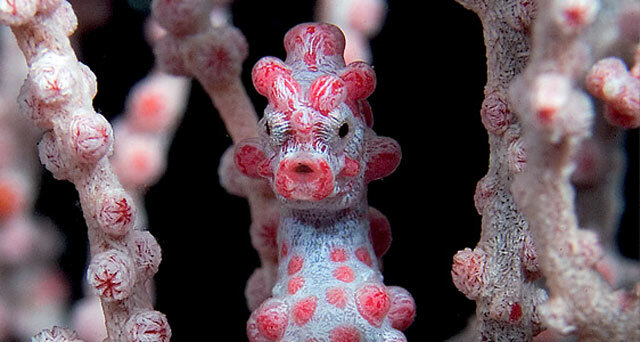 The pygmy seahorse is the cutest thing I have ever seen. Thanks for hosting this fun party. I just linked up so hope it works. I look forward to visiting all the other party participants. I'll always remember the nasty board you pulled out of a trash pile & repurposed in to a beautiful sign years ago. You adorned it with shells, paint, & some old rope & made a beautiful piece of art out of it. 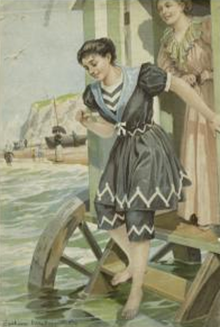 The quote you painted on it said "Does the romance with sea start at the shore or in the hearts of those who love her?" In your case I know the answer. OH. MY. GAWD. 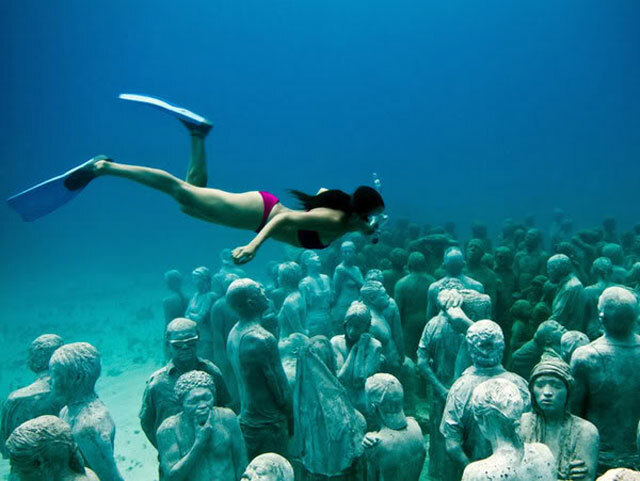 I have chill bumps running up and down my arms...that is the most awesome post about the underwater museum I have ever seen. Not only is that THE coolest idea I've ever heard of...but now you've just made my mind up about going to a wedding in playa del carmen in aug. Wasn't really big on it but now? 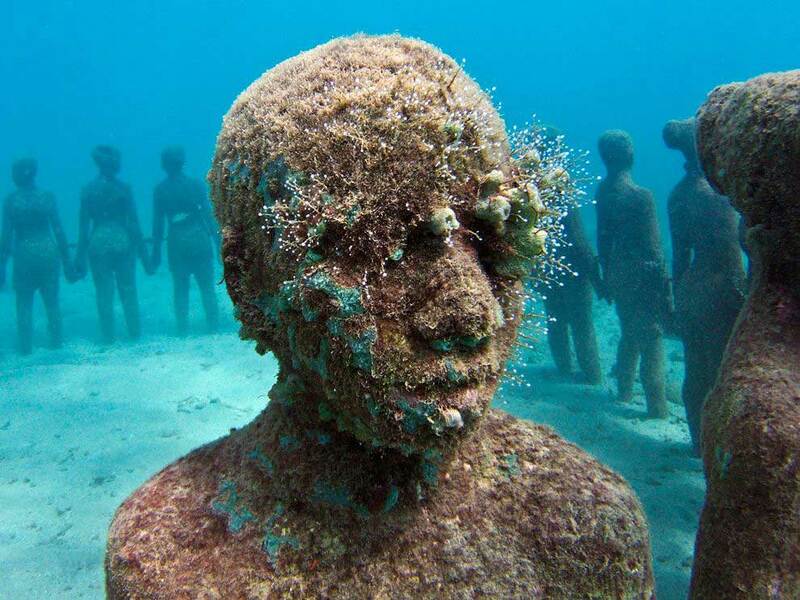 OH MY....I've got to go dive and snorkel that sculpture area!!!! WHAT a beautiful piece of art!!! WHAT an ingenious idea. Cannot wait to go read everything there is to read about him. So Damn Cool. Happy World Ocean's Day to you too dear friend..thanks for caring so much!! It is encouraging to know that so many people care!! Thanks so much Rhonda!!! Happy Oceans Day!!!! One more thing SB....are any of his images for sale? that one of the colorful coral beginning to cover one of the statue...and the little girl one? OH mY...I would love to have those pieces!! Do you know? I love this art! I blogged about this back in March. I definitely want to dive and see this one day. Happy Ocean's Day! Rhonda - what an amazing story! Thanks for sharing such a fabulous post and for hosting today! Happy World Ocean's Day! ANOTHER fantastic post! That is so interesting and its something I've never heard about. I love your linky for World Ocean Day. I also agree with Jane - someone needs to teach us how to make a button. Thanks for another fun post! Hugs! Happy Ocean's Day, Rhonda - thank you for everything that you do educate readers! 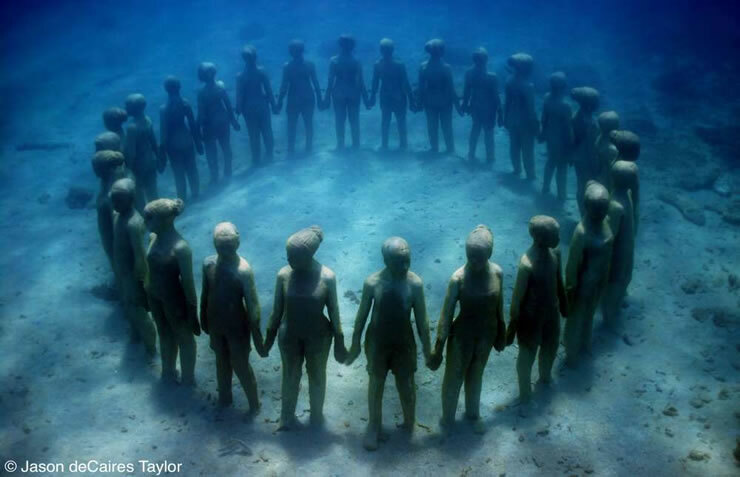 Thank you for sharing this amazing place under the sea where art and the oceans can thrive together. We share a passion to conserve our oceans not just look at them for their beauty. Rhonda, thank you so very much for sharing this. 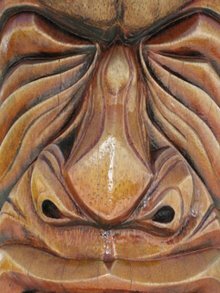 My mouth literally droped looking at all this beautiful work!It is ingenious! thanks for bring the awareness to all of us! Thank you from the bottom of my sea loving heart. This is just the most amazing, informative post I have ever had the pleasure of reading. You are an incredible writer. Awesome post. I am saving this. To read over and over again. i think I will have to go back there someday! Love the post and Happy World Oceans Day!!! Bravo! You have outdone yourself with this post! I will have to see this museum one day for sure. Way too cool. Happy World Ocean's Day and way to go to spread the ocean love, girl. you've outdone yourself this time!!! loved it from start to finish!!! and what a great turnout!! I am just flabberghasted Rhonda!!! This artist is amazing, and the pics just had me wide-eyed and wider mouth! I wish I would have had time to link something up but I am so enjoying these posts! 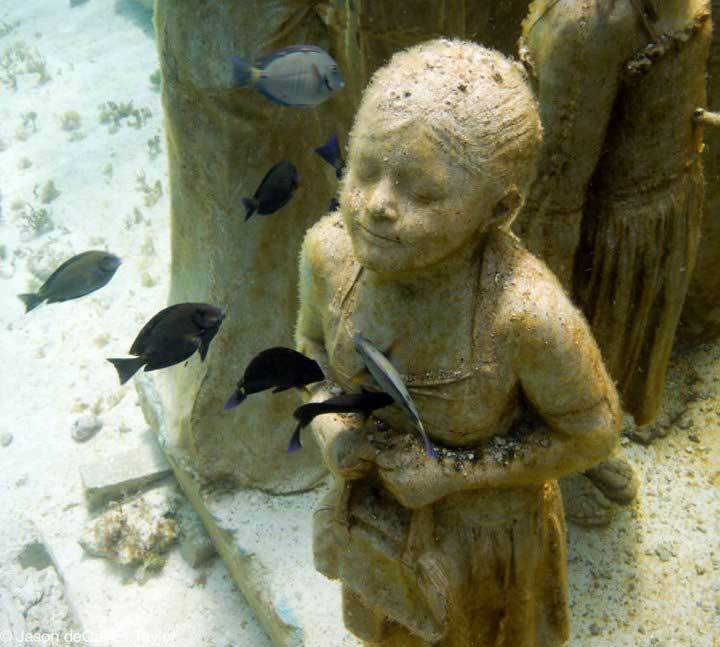 One of my favourite words in the english language is 'symbiotic'.. both in meaning and sound.. [ok so I'm a freak.. haha].. but.. this artwork.. is phenomenal and certainly lives up to that word.. Breathtaking.. the statue of the young girl and that shot with the fishes.. brilliant.. it tugs at my heart.. Thank you so much for sharing this with us Rhonda and for hosting your fab 'beach party'.. I'm late!! but finally here and will be back tomorrow to visit the other participants... which I'm sure will have more altruistic posts than me!! What an awesome success, this World Ocean's Day Online Beach Party!! Totally enjoyed the underwater museum...good music, too on that YouTube presentation! This post was a LOT of work, Congrats on your passion for our natural world! 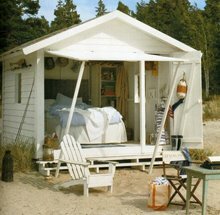 I'm not at the beach for the summer...miss it sooooo much! Thank you so much for hosting this linking party!! I hope that our blogging voices DO make a difference. 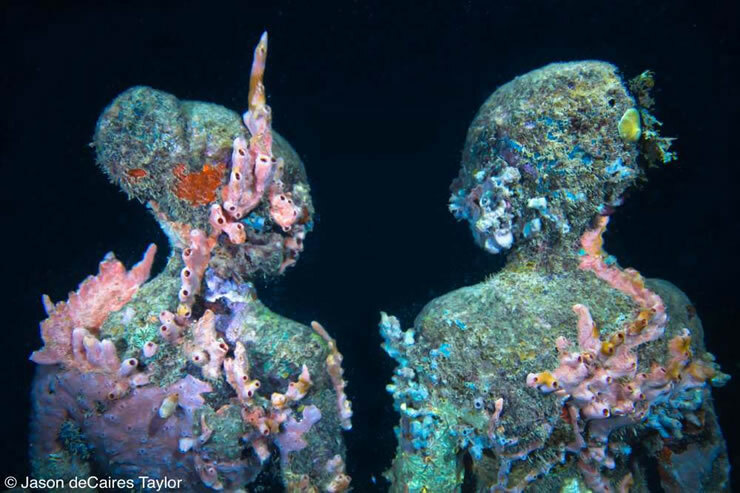 I was awestuck by Jean deCaires Taylor's amazing underwater museum. What a fabulous way to start a new coral reef. I came to your blog after visiting "Lavendar Dreams" and after reading your post, I HAD to create a post on my blog. Thanks for stopping by my blog and leaving such kind comments. Thanks. This is so awesome! I already liked Jason's FB page. OMG! This is amazing! I shared this with the Mr. and he loved it too. I am in awe. Seriously! My first impression was why would you want to destroy the oceans natural habitats with this. Then after reading your post and thinking it through more I realized how wonderful it really is. Thanks so much for sharing this with us. I wish I could be lucky enough to see some of this in person one day! As always, what a wonderfully interesting and informative post. I love it! Amazing! That is so cool and SO beautiful. What kind of birds are in your yard?